People say that when life throws a football at you, then you should score a goal. Sadly life has been scoring goals from all corners and all my attempts to prevent it has been futile.Goals, Football and Euro have been the flavour of the season. Sadly I try hard to come up with things that I had planned but at the first place, plans never succeed. Those are just random ramblings. I had set many goals when the year began and eventually they faded away and I find myself in a fix shouting don't fade away! Life has indeed been cruel to me. It's okay! A true warrior fights back and turns every opportunity into gold. At the start of the year, I was confident that I will accomplish all my short term goals. But at the half time, I realise that I am not even close to it. Forget accomplishment! So what have I achieved till date in this year ? Zilch! Negatives have overshadowed the positives. It's okay to be positive at times , but my confidence level masqueraded by laziness took me to a new down. Thanks, I now find myself floundering like a fish on a tile! Life teaches us through different circumstances and it's our duty to make most out of it. Enough of the rants and ramblings. I embarked on to this year with a positive note though nothing eventful happening on the job front. But I cleared my certification. Till date, I have been trying hard to find a better opportunity for growth purposes but I haven't succeeded yet but I postponed that plan till my appraisals. How Clever! Eh, Stupid! Then came the month of March where I successfully delivered a project at work. It was the first time I tasted the responsibility of leading a project as a backup lead and I let no one down. April saw a group of bloggers taking part in the A to Z Blogging Challenge 2016 that exposed the creative side of many blogger folks. Richa Singh of BlogChatter along with some other creative souls of the same community established the community challenge where all bloggers of the community took part. The best part was that everyone successfully completed it. Many of them faltered but stood firm and got it to closure. I completed it successfully, thanks to the short 55 fiction coupled with two character #HeSheStory concept. When I look back , I realise that the last time I went for a long vacation was in November. It has been a tight and a packed scheduled. Even right now I feel like packing my bags and going off to a long vacation. But sadly work front, there are many commitments. 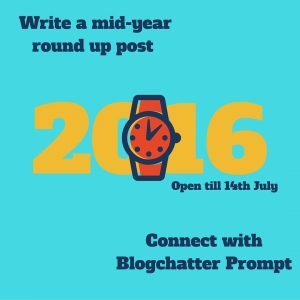 I also got introduced to a lovely blog buddy group named BlogWiz. The erstwhile blog buddy group Blogberry was dissolved and BlogWiz was created. So far, BlogWiz has tread through the same path as that of Blogberry. We will strive hard to ensure that we don't deviate but we have some amazing folks in the gang.